The first Mass of Our Lady of Perpetual Help was celebrated in a parishioners home by the Rev. Urban de Hasque on August 21, 1902. Under the direction of the Rev. William Huffer of Lawton a church was established and built in 1904. The Congregation consisted mostly of farm families in the area. In 1909 the first school was established. In 1910 during the residency of the Rev. Anthony Van der Grinten the first rectory was built. On December 22, 1928, fire destroyed the church, but action was quickly taken to build a new one. This church is in use today, and was built during the pastorate of the Rev. James Wagner. On October 8, 1929, Msgr. G. Depretiere dedicated the present church to Our Lady of Perpetual Help. The school was closed by the school board in 1933 due to lack of financial funds. In 1942 the second rectory, which is no longer standing, and a new school were built by the Rev. Michael McNamee better known as Father Mac. The school opened in 1942 with the Sisters of the Most Precious Blood from a convent in Wichita Kansas teaching grades first through six. The old school building still stands and serves as a fellowship hall, religious education classrooms, and for various other parish activities. 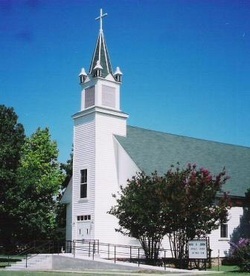 Elgin is eight miles west of Sterling and roughly eighteen miles northeast of Lawton The first church, St. Anthony’s, was located in a former schoolhouse that the congregation purchased some time between 1910 and 1914. Before that, Father William Lamb came from Lawton for Mass on weekdays. 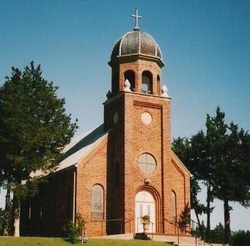 Elgin was a chapel of convenience, a place where local funerals and weddings could be celebrated, but without a regular Mass schedule, until 1941, when it was finally raised to the status of a mission. In 1941 the people began plans for a new church. Rev. Michael McNamee, then pastor, established a sinking fund with each of the families donation money or livestock. The fund grew steadily and through the help of Bishop McGuinness, the sum of $5000 was donated by the Catholic Extension Society, provided that the church be named St. Ann’s in memory of the donor, Anna A. Beckert. In a special drive, non-Catholics of Elgin donated more than $1000 toward the new church. Construction of the building was started in November, 1946, with much of the work being done by the members. In May, 1947, Rev. McNamee resigned because of illness and his successor, Rev. Meis, was given the task of completing the church. After the new church was dedicated May 11, 1948, the former St. Anthony’s Church became the parish hall. When the new hall was built in 1967. In 1997, a rectory was built and the pastor moved from Sterling to Elgin. Thus the chapel from 1910 became a full-fledged parish in 1997. New classrooms were built for the religious education program in 2004. Urban de Hasque was a young Belgian priest, newly ordained and less than one year in the United States, when he wrote the following account: “My first visit to Apache occurred on October 9, 1901. I drove to it with one of Father Isidore Ricklin’s teams on the occasion of a brief stay at St. Patrick’s Mission of Anadarko. The following month I was appointed pastor of Chickasha with jurisdiction over the major part of the ‘new country,’ the Comanche-Kiowa-Caddo reservations opened for settlement during the summer of that year. Apache was about four months old, when I held their the first service on November 27, 1901 in George Rose’s building. After that first Mass I returned regularly for the monthly service on the fourth Saturday. The congregation was rapidly organized. A committee secured options on vacant lots on which to build a church. Bishop Meershaert came in person on April 9, 1902, to consider the real estate propositions, but the one he favored was not to be the one adopted by the committee. Sometime during the following two years the committee bought two sloping lots on which they built the church. As a number of people did not like the location, the contributions did not come in as promptly and as generously as the trustees had expected, with the result that when the structure was completed and ready for use, there remained a number of unpaid bills. The debt had not been settled in full in the summer of 1904, when during the temporary absence in Europe of Father Huffer, I celebrated Mass in the church on the first Sundays of July, August, September and October. There was then question of moving the building to a more spacious location on which eventually a rectory and perhaps a parochial school might be erected. This was done after Christmas 1905. The church stood on its new location, where it stands today. To the east of the church a rectory was built by Father Frederick Van der Aa, the first resident priest, who occupied it from 1907 to 1925. Plans for a parochial school have yet to be drawn. At present Apache is a mission of Elgin.